The last two weeks have been the most exciting, stressful and rewarding weeks of my short farming career. After almost seven months of happy, healthy living in the paddocks it was time to start taking the ‘Wanganui 9’ pigs to the abattoir. For the week prior to the trip I had started to coax the pigs from their own paddocks up the race and into the transit paddock. My paddocks are arranged so that by leaving the gates open and carefully placing piles of food they will basically do all the hard work for me. After just two days I woke up to find five pigs in the transit area. One of these was a pig that I had earmarked for breeding so she was to be transported separately to the breeding paddocks leaving four pigs to take to the abattoir. The trip was planned for early Monday morning and to reduce stress on the pigs before the trip we planned to feed the pigs on the trailer Sunday night and let them spend the night there. Reuben came round on the Sunday night and we laid a trail of irresistible Korker Porker, succulent pig feed, up the ramp and into the trailer. The pigs smelt a rat and had no intention of climbing that ramp. A four hour battle ensued and having now enlisted Darren, Reuben’s father from Kapiti Free Range, we used pig boards, pallets, electric fences and physical strength to slowly direct the pigs up the ramp and into the trailer. After four hours we had managed to get just three pigs onto the trailer one by one. The first was easy, the second took about and hour, the third took the full four hours and the fourth beat us completely. We locked up the trailer, covered it for the night and my first trip to the abattoir was set to be just three pigs. The next morning I was up at 6am to feed the rest of the herd and hook up the trailer, at 7am Reuben and I left the farm for the hour and a half trip to the Abattoir in Wanganui. Most abattoirs don’t take pigs for slaughter, preferring to focus on the greater numbers of cattle and sheep that most farmers bring. Because of this we are not able to use the abattoir ten minutes up the road in Levin but instead we had to search for a suitable abattoir and for us it is either Wanganui or Masterton, given that Wanganui is the shorter journey that was our destination. Arriving at the abattoir I surprised myself by backing the trailer up to the arrivals lounge in less than twenty attempts and we opened up the back doors, the pigs looked around, looked at me and casually stepped off the trailer and trotted happily down the ramp into the abattoir. I mumbled a little ‘thank you’ to them as they left on the next part of their journey to help make Woody’s Farm commercially viable. It’s never nice to see your animals for the last time but they had an excellent life on the farm and through their food they will be remembered, a far better eulogy than the majority of intensively bred pigs would get. It was back to the farm for Reuben and I. The pigs shot off down the ramp into the abattoir, no time for goodbyes. Two days later the circle of life was completed when Paula Deen went into labour and produced ten healthy and happy little piglets. This was my first experience of pig farrowing and I really didn’t know what to expect. I watched as she got close to farrowing time, her teats filled up with milk in the space of a day and almost hit the ground, she started to arrange the straw in her hut into a nest and her flat mate, Marigold, was clearly told to move into the other hut from now on. A few hours later I headed back to the hut for a checkup and Paula was already surrounded by nine little piglets, shortly after a tenth appeared and the night set in. Being focused on the health and wellbeing of my pigs I don’t use farrowing crates or sow stalls, the pigs give birth in their own huts and make their own nests, the downside of this is that a mother might, by accident, squash one of her babies in the night. The next morning I gingerly walked up to the pig hut to see Paula and the piglets, there she was resting with ten little piglets gently and enthusiastically sucking on their mothers milk. I breathed a sigh of relief. Paula Deen still giving birth, one more to come. Huddling together for safety and warmth. Claire and I barely had time to gaze on the piglets and take photo’s before Marigold herself retired to her own pig hut to nest and prepare for her farrowing. It was late in the evening as I watched her lay in her hut, gently grunting. The piglets began to come. After five piglets it was now dark and the rain was not letting up, fearing that I wouldn’t be able to cross the river to get home I left her for the time being with the intention to come back a few hours later. Unfortunately the rain got heavier and the Waikawa stream rose fast and furious, at 8pm I realised that I was not going to be able to cross the river till the morning. Cursing my iniabilty to buy the $150,000 bridge that bridgeitnz.co.nz had quoted me, I went to bed. The next day at 6am I was up like a shot, it was still dark and the river still high but I crossed in the tractor and walked the rest of the way to check on Marigold. Waiting for me in the pig pen was eight little healthy piglets and one VERY tired mother. I laid some food in front of her and she slowly chewed it down, the piglets squeaking as she moved. As I looked around the hut I noticed a small black shadow and realised that my fears had been met, one little boy had not made it. I reached across and scooped him up in my hands, cold but still perfectly formed. As I mentioned before this is one of the drawbacks of free range farming, but it is also one of the realities of nature, we had lost one but we had gained eight. Marigold in mid farrow. Grunting gently and the piglets start to appear. The next morning eight little piglets scurry around the pig hut. In just two weeks we had taken three pigs to market, watched two mothers make nests, greeted 18 happy and healthy piglets and buried one. And to add to all that I ferried Ruth (the one pig I saved from the Wanganui 9) over the river to her new home with Hugh, a little bit of pig matchmaking. Tomorrow we go to the Farmers Markets, its been a lot of preparation, getting the pork, the labelling machine, the marketing material, the website, the packaging, the aprons, tables, fridges and even an office. Maybe one day I will tell you all about it, but for now lets just all go gooey for this little piglet……. 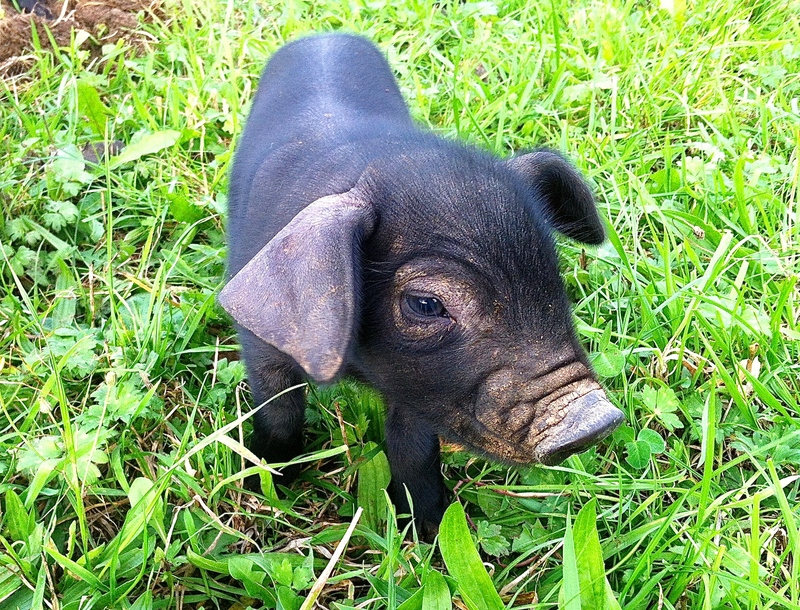 This is a Large Black (Devon) piglet, one of Paula’s little babies. A week in the life of a new farmer. The last two weeks have been the busiest so far. At the same time as getting ready for our first farmers market we have been preparing the first pigs to go to the works (abattoir), rescuing goats, checking on expectant mothers and dealing with mother nature, all in all a busy week. As some of you will know, last week we got the tail end of Huricane Ita. She hit with vengeance and managed to scare both Claire and I so much that we went to bed at 7:30pm in the hope that in the morning we would not be waking up on the yellow brick road with a cowardly lion and tin man for company. The next day I went out to survey the damage and found that, whilst it could have been worse, it had definitely given me a few extra chores. The chicken houses lost their roofs and were tossed from the pallets they sit on. This giant gum tree came down in the neighbours paddock. The neighbours trees were uprooted. One of the pig houses, luckily recently vacated by Hugh, was completely destroyed. Delia and Maggie must have got a real shock when their house took off and landed upside down. My ‘hoop house’ was ripped apart by the wind. By far the worst effects were on the pig houses. Those made of pallets weigh so much that a direct hit would have made no difference but those made of 2″x4″ and plywood were like paper to the Hurricane. One was destroyed, two were moved and the last flipped end over end onto its roof. None of the pigs were hurt, thankfully, but they did seem a little shocked the next day. 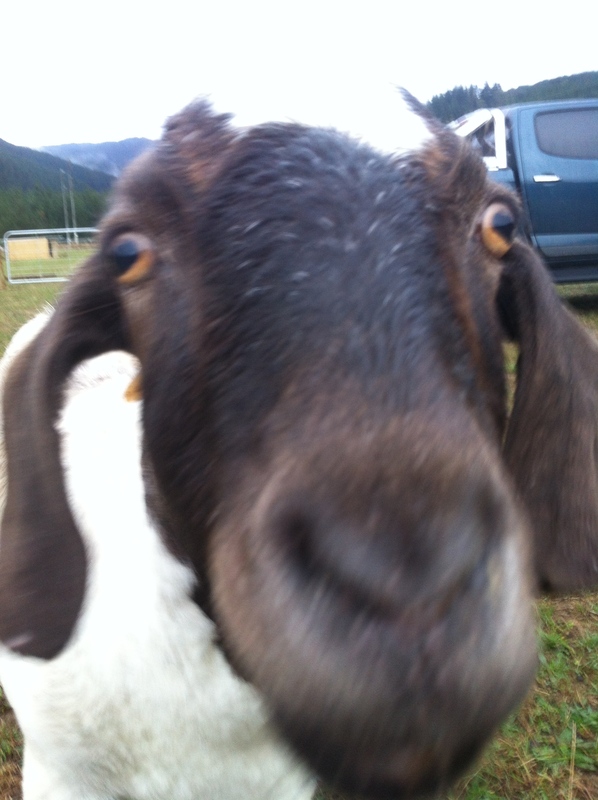 Delia, who would have been in the house that flipped, had ran through the electric fence in panic only to find herself in another paddock next door, where she spent the night without shelter. The Chickens had faired well as they had headed for the bushes at the first sign of trouble and probably spent the night huddled together as they watched their houses being rolled along the paddock, again no one was hurt. The Hurricane was an annoyance but only lasted for one evening, the rain was worse. As I went about the job of fixing up the farm and making sure all the electric fences were working the rain continued to fall. The paddocks got muddier and the river started to rise. As I mentioned on my last blog I have a plan for the river and it was tested, as was the Ute and the tractor. Crossing the river became a test of nerve and walking around the paddocks a game of trying to keep my wellies (gum boots) on my feet and not sucked off. The pigs missed just one meal and seemed all the better for a little diet. Emily, pushing her luck as always.